Proper Weight Lifting Form vs Heavy Weight – Which is Best? Weight Lifting “form” does not merely refer to appearance; “form” refers to how and how well movements are executed. Let’s be clear… form matters. 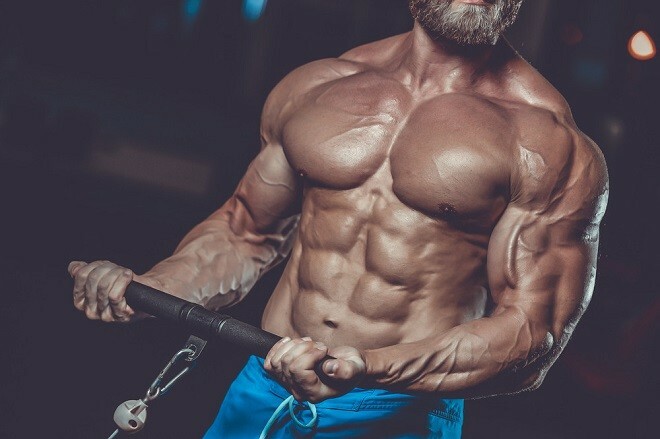 Excellent exercise technique is a must – for bodybuilders, or anyone with the goal of building muscle – despite what you might have heard. Poor exercise form can lead to poor target muscle stimulation, and injuries. The very best training program, gym equipment, nutrition plan, and recovery schedule will mean nothing if you’re aimlessly throwing weights around. The absence of excellent exercise form can cause joint pain and injuries, poor gains in muscle growth, and ultimately, failure. The weight can be strongly bounced off the thighs at the bottom of the movement and forcefully rebounded upward, with the torso leaned far back. The weight can be lightly bounced off the thighs and the torso leaned slightly back as the weight is lifted up. The weight can make no contact with the thighs, and the torso remains straight. Which of those ways is the ideal way to perform a repetition of the barbell curl? The answer is never A, rarely B, and almost always C.
You see, it depends on whether you are just beginning your set, partway through, or at the end. The last example – in which the weight makes no contact with the thighs and the torso remains straight – is what is called “strict form” – this is the kind of excellent form you should apply to every set of every exercise. However, the thing about weight training is that it isn’t a completely static process. Movement is involved, and attempting to curtail any movement outside the tightly defined confines of a particular exercise, as one would if using only strict form, is a double-edged sword. Using strict form is the best way to apply growth stimulating tension on a target muscle through its range of motion, and reducing the risk of injury, but it also diminishes our ability to push hard for that last rep, or two. The first example on our list – in which the weight is strongly bounced off the thighs and the torso is leaned way back – is quite the opposite of strict form and should be avoided, always: it allows for more weight to be lifted, but moving lots of weight is not the goal, the goal is to stimulate the target muscle for growth. This unnecessary momentum will recruit other muscle groups you may not wish to target, and increases your risk of injury. Bouncing the weight off the thighs and leaning way back when performing repetitions of a barbell curl takes the tension off the target muscles you’re trying to grow, in this case the biceps. You may be able to move more weight with such poor from, but that’s only because the tension is being distributed to other muscles to create momentum. You see it all the time, guys heaving too much weight with sloppy form, in the belief that this is some increased trigger for growth. Now power lifters, that’s a different story, since moving weight is all that matters to them… but not for bodybuilders. Let’s say my long-time training partner Thomas curls a 15kg dumbbell (his ideal weight) with very strict form. The biceps are contracting under tension to move the 15kg dumbbell. Therefore, the muscle is maximizing the use of that weight. Now, let’s say Thomas curls a 25kg dumbbell (that’s too heavy) with very sloppy form, heaving the weight, and swinging his torso back to create momentum. The biceps may be responsible for moving some of that 25kg, but so too are other muscles, used to create that swing, to move the weight. The weight and tension is distributed across other muscles. You could say his biceps are responsible for moving 15kg, and the other muscles (with the help of some momentum) moved the remaining 10kg. I think you get the picture, too much weight and sloppy form creates a diluted affected by distributing tension across other muscles, and away from the target muscle. So, if you’re wondering if it’s better to lift heavy or light weights to gain muscle, I can tell you now what exercises performed with a moderate load in the 8 – 10 rep range, and with good form, can make a big difference to your training and results. Work through your sets with deliberate, good form, smoothly and confidently. Focus your attention on the muscle contracting and maintain tension on the muscle throughout the set. For best results, begin a set using very strict form, try to maintain that form and tension on the muscle through the whole set. Eventually, when your last couple of repetitions become too difficult, seek the “middle path”: relax your form slightly and finish the last couple of reps. 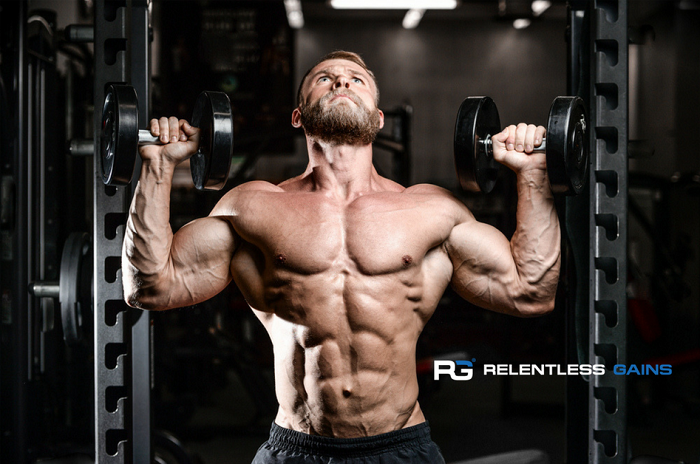 Starting with strict and transitioning to moderately relaxed form on your last couple of reps is the ideal way to perform a heavy and intense set. Your last 1 – 2 repetitions as you fatigue and reach muscle failure is the only time your form should loosen up. It’s important to maintain strict from and tension on the target muscle through every set to provide the target muscle with maximal growth stimulation. Don’t try and lift weights that are too heavy for you to handle. You’re not training to be a power lifter, you’re training for muscle growth, and that means lifting weights you can control with good form through your entire set. Lifting weights that are too heavy for you is the fastest way to poor results and an injury. We all want to be big and strong, and some people want that from day one. But keep in mind that your goal is to build muscle, not for the sake of appearing super strong to others. Uncontrolled swinging, Jerky stops/starts can put serious stress on ligaments and tendons. Damaging a tendon can put you out of training for months. Hindrance to good form is succumbing to the desire to lift very heavy weights from the get-go. While true that lifting too light of a weight will have little positive effect, doing the opposite, especially with incorrect form, can result in torn damaged ligaments or tendons, and joint pain, which will seriously impede progress. 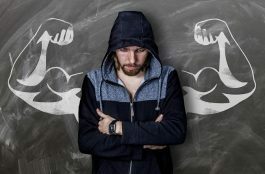 Don’t lift like a meat head or try to impress your gym buddy by lifting too much weight, lift inelegantly by subjecting your muscles to sufficient tension. Correct weight selection (75 – 80% of your 1RM) will reduce your chance of injury, improve your control, and optimize target muscle tension for growth. When training, remember this key point: the end goal is not simply to move the most weight from point A to point B; it is to exercise the involved muscles throughout the weight’s trajectory. Be conscious. It isn’t just where the weight travels; it’s how it gets there. If you’re inexperienced, you must first learn how to perform exercises properly before starting fully, any progressive hypertrophy focused training program. 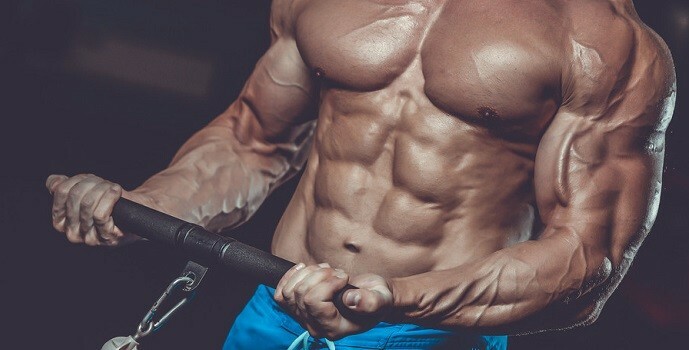 You’re inside your first year of following a consistent, intelligent weight training program. You’ve trained properly and made good gains in the past but have stopped training for at least one year and lost most of those gains. You’ve been training inconsistently, on-and-off for a year, or several years. Now, you may have found a split routine online that you want to follow to build muscle and increase strength. But before you jump in, you must take the time to learn excellent exercise execution if you fall into any of the above-mentioned categories. The point of this beginner lifting phase is to condition your nervous system and muscles to contract through the correct movement patterns, so that you’re maximally stimulating the target muscles for growth. I recommend doing this for around 4 – 6 weeks, to learn the correct way to contract and coordinate your muscles for each exercise. 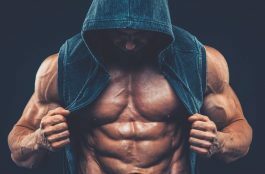 This phase is not to overload your muscles with a lot of weight or reach failure – you’re not looking to make any gains here. You’ll be working with a weight that is around 65% of your 1RM. This would be a weight heavy enough that you’d reach failure around the 15th rep. 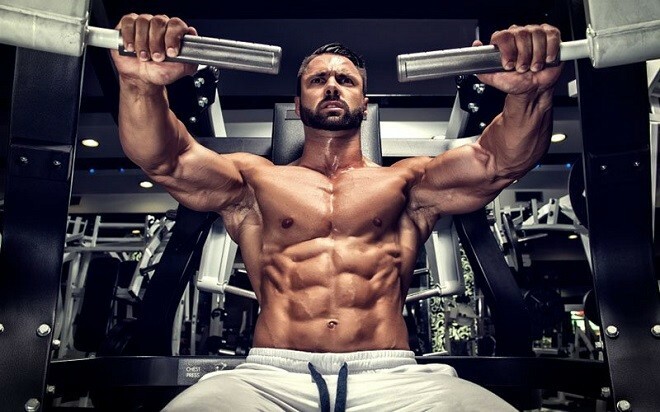 However, you will not take each set to failure – you’ll stop way short of that at around 10 reps.
Only use a moderately light weight you can easily handle with PERFECT form for around 10 reps.
Beginners want to work at a low intensity with a primary focus on proper form on every rep of every exercise. Focus on initiating and contracting the working muscle with perfect form, in preparation for heavy high intensity training. Learn how to do each exercise PERFECTLY. The best way to learn how to perform each exercise perfectly is to have someone competent in applying correct exercise execution show you. But, finding that person can be tricky. Do not automatically assume that the personal trainer (with a cheap entry level certification) in your gym knows what he/she is talking about when it comes to proper exercise form. Just because that “fitness professional” has memorized some test question to obtain a flashy certificate, does not mean they know everything. Some of the stupidest, most nonsensical things I’ve heard in the gym have come from the mouths of personal trainers. True story… I was once told by a personal trainer that the Smith Machine was a useless piece of equipment. Tell that to the thousands of people who have used that machine to build muscle, successfully, and safely. Anyway, my point is that not all “fitness professionals” know what they’re talking about. Don’t get me wrong, there are a lot of great trainers out there that know their stuff, but they’re few and far between. Also, don’t think the biggest guy in the gym knows what good form is, either. The best way to learn proper exercise form is to find a trainer with a good reputation who can show you, and/or teach yourself. Take the time and learn key exercises of your chosen training program, and how to perform each exercise perfectly. Muscle hypertrophy is only optimized and maximized when you develop skill and neurological adaptations from learning (by doing) the exercises. Your ability to coordinate and activate muscle fibres will maximize growth stimulating tension across the target muscle. I’ve seen some shocking exercise form from experienced lifters, so don’t think your lifting technique is perfect because you’ve been training for a while. Everyone could do with taking a step back to check their form and tighten up on any bad lifting habits that might have developed without you even noticing. When most people enter the gym to train, they just think about moving weights. It’s a view of the external environment – push the barbell away from your chest, lift the dumbbell up, pull the cable down – it’s all about what’s happening on the “outside”. But, that’s where people go wrong, because it’s what your muscles are doing on the “inside” that really matters. When you’re doing an exercise, first, you need to know what muscle the specific exercise is targeting. Then, when doing the exercise, think about how that muscle is contracting, how the muscle is taking up tension to move the weight. Your focus should be internal, on how the muscles are working to move the weight. The mind muscle connection is no joke, it’s real. Simply lifting or pressing a weight without thinking about the working muscle involved can lead to poor form. Good form is when you think about that “mind muscle connection” to move the weight. Good form gives you the ability to focus that growth stimulating tension on the target muscle to maximize its development. Master the movements, then you can increase the load. Prematurely lifting heavy weights without knowing how to contract the target muscle with good form can seriously impede progress. You’ll end up shifting growth stimulating tension away from the muscle you’re trying to improve, reduce your time under tension, and decrease your range of motion. Only good lifting form with moderate loads can fix that and produce optimal gains and the success you’re looking to achieve.